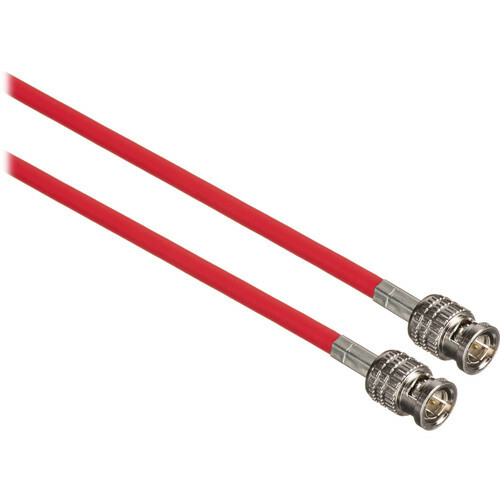 The Canare 3 ft HD-SDI Video Coaxial Cable - BNC to BNC Connectors (Red) is a precision serial digital video coaxial cable that offers throughput for HD-SDI video signals for professional broadcast applications. Thanks to dual copper braids that impart high flexibility and foam PE dielectric insulation, this RG6 coaxial cable can be bent around tight corners or run through tight spaces, while still providing a high-quality, low-loss transfer. Box Dimensions (LxWxH) 8.0 x 7.8 x 1.0"
3 ft HD-SDI Video Coaxial Cable (Red) is rated 5.0 out of 5 by 1. Rated 5 out of 5 by WisconsinDP from Perfect cable for onboard monitors. Supple and tough. I have used this brand for years.